It was a bit expensive for a dust-catcher, but damn funny. I own a piggy bank with Kapitalistenschwein written on it. That’s a slot on his head for coins, right? It’s not just a bust, but also actually a [piggy] bank? And maybe there’s no stopper to open, so if you want your Capital back, you have to break the bank. How revolutionary! There was a ceramic artist at a local craft fair who used to make storage containers in clay, with clever labels like “bones of my enemies” and “my children’s future” etc. I love surrealism. Yup. And it looks pretty big; big enough to hold all of the tax money Apple pays the federal government annually, for example. Fill it with pennies and it becomes a murder weapon. Not a very good murder weapon though. A good one wouldn’t leave any Marx. … and then the police will bust you. 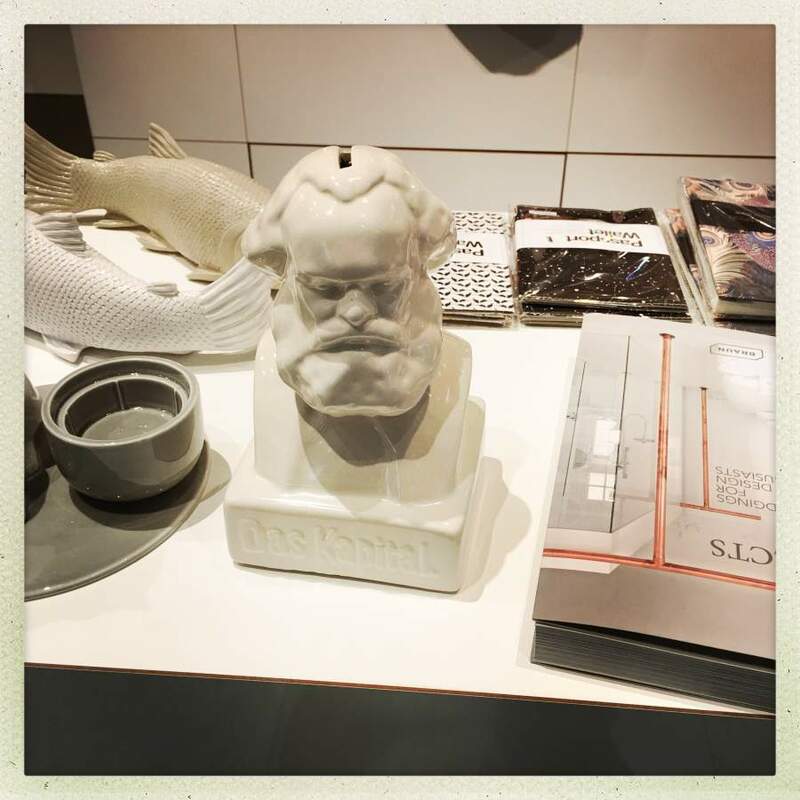 The tourist office in Trier (Marx’s home town) have a bottle of Karl Marx wine for sale; obviously it’s a red wine. I rather like the fish too.